Earnings from the two search leaders are coming and guess what? Google's eating Yahoo's lunch. NEW YORK (CNNMoney.com) -- If the search firms Yahoo! and Google were baseball teams, Google would have to be considered the New York Mets. It can do no wrong. Everything is clicking. But Yahoo? Well, it's stumbling around like the Bad News Bears. Yahoo stunned Wall Street last month when chief financial officer Sue Decker somewhat casually said at a Goldman Sachs conference in New York that sales for the quarter would be at the low end of the company's forecast due to softness in auto and financial services advertising. It seems like more and more investors and consumers are choosing Google over Yahoo. A tale of two search engines: Google's stock has recovered after a rocky start to 2006. But it's been all downhill for Yahoo this year. Google is the only top search company to gain market share in August. Will acquiring YouTube make Google a better investment? At the time, Wall Street was expecting that Yahoo (Charts) would report sales excluding the cost or revenue shared with partners of $1.18 billion for the third quarter. Now analysts are predicting sales of $1.15 billion. Yahoo is due to report on Tuesday. Decker's comments were the last thing investors wanted to hear since Yahoo already was struggling from delays to its much-hyped new search technology for advertisers. The platform, code-named Panama, was supposed to be rolled out at the end of the summer Yahoo told Wall Street in July that Panama was not going to be released until the fourth quarter. Google, on the other hand, keeps wowing the Street. It bested sales and profit forecasts for the second quarter back in July. And on Monday, Google (Charts) unveiled a deal to buy YouTube, the popular online video sharing site, for $1.6 billion, a marriage uniting the top search engine and No. 1 video site. Analysts were raving about Google's chances to get a big piece of the potentially lucrative online video advertising market. Wall Street clearly is betting Google will flourish and Yahoo will founder again when the rivals each report results next week. Google has recovered from a rough patch earlier this year and the stock is now trading slightly higher for 2006, less than 10 percent below its all-time high. In fact, Google is one of just a handful of major Internet stocks to be in positive territory for the year. Shares of Internet conglomerate IAC/InterActive (Charts), which owns Ask.com, are up slightly but eBay (Charts) and Amazon.com (Charts) have both tumbled more than 30 percent. Yahoo has seen its stock plunge nearly 40 percent this year, making it the second-worst performer in the S&P 500. On Friday, the stock hit its lowest point since April 2004. Even though Yahoo is expected to report sales grew 23 percent from a year ago, meeting this forecast probably won't be enough to satisfy Wall Street. The problem for Yahoo is that it is inevitably compared to Google. And when Google releases results on Thursday, its numbers are likely to outshine Yahoo's by a wide margin. Analysts are predicting that Google will report sales excluding partner costs of $1.82 billion, a 73 percent jump from a year earlier. Google's earnings are expected to come in at $2.42 a share, up 60 percent from a year ago. Yahoo, meanwhile, is expected to report earnings of 11 cents a share, including the effect of stock compensation. That's a decrease from 14 cents on the same basis a year ago. 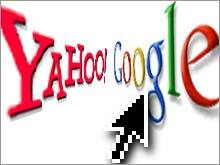 Yahoo is playing catch-up with Google in the hot market for paid search, ads tied to specific keyword queries. According to the most recent numbers from Web tracking firm comScore Networks, Google widened its lead in search over Yahoo in August. So that's why it will be crucial for Yahoo to give Wall Street more information about when Panama will be rolled out and how much the new technology will boost Yahoo's search revenue. "At this point, I think Yahoo will lose all credibility if they don't come out with a firm date for Panama," said Sasa Zorovic, an analyst with Oppenheimer & Co. "The ad slowdown is more of a Yahoo issue than an industry issue. People look at Google and see Google bypassing Yahoo." Analysts from investment bank Piper Jaffray had some more bad news for Yahoo in a report published Friday. The Piper Jaffray analysts wrote that executives from three prominent online advertising agencies told them during a conference call that Yahoo is lagging behind competitors like Google and News Corp (Charts)., which owns the popular social networking company MySpace, in the launch of new services. Yahoo, however, is said to be having on-and-off talks to by social networking site Facebook. "The agencies indicated that Yahoo has been too late to capture much of the Web 2.0 growth, often coming out with offerings much later than competitors (i.e., blogs, competitive search platform, video). Essentially, the coolness factor of Yahoo's products has diminished by the time they come out to the market." the Piper analysts wrote. What's more, Piper reported that ad agency executives said they were not seeing the weakness in financial or auto advertising that Yahoo cited last month. With this in mind, Zorovic said he thinks Yahoo probably will report results for the third-quarter that are merely in line with reduced expectations and that the company was unlikely to raise fourth-quarter sales forecasts. The company doesn't provide earnings guidance. Analysts currently expect Yahoo to report sales of $1.31 billion excluding partner costs and earnings per share of 15 cents a share for the fourth quarter. Google, though, will most likely surpass forecasts, Zorovic said. As a result, he thinks analysts will probably raise their fourth-quarter targets after Google reports. Google doesn't give Wall Street any financial guidance. Analysts are predicting Google will generate sales ex-partner costs of $2.1 billion in the fourth quarter and a profit of $2.76 a share. And looking ahead to next year, Yahoo could face a much tougher challenge from Google in so-called display advertising, sales of video ads, banners and other ads not tied to search results, thanks to Google's pending deal for YouTube. Yahoo has so far maintained an edge over Google in display advertising, which tends to be more attractive to big brand-name companies than search ads. But it is a big market opportunity for Google. Youssef Squali, an analyst with Jefferies & Co., wrote in a report Thursday that display ads account for about half of all online ad spending. "Google expects YouTube to become a coveted channel for its clients, bringing it closer to Yahoo! in competition for display ad dollars," Squali wrote. Analysts quoted in this story do not own shares of Google or Yahoo. Piper Jaffray has done investment banking for Google.